Jet Airways American Express with 2500 bonus JPMiles! 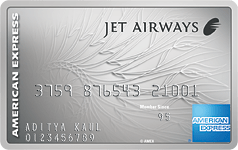 The Jet Airways American Express Platinum card was launched in 2012 and has been a staple fixture in my wallet ever since. This is one card which comes with some significant benefits, all of which I have used at some point or the other. 8 JPMiles for every Rs. 150 spent except for spend at Fuel, Insurance, Utilities and Cash Transactions, making it 5.33 JPMiles for every Rs. 100 spent. 16 JPMiles for every Rs. 150 spent for booking revenue tickets on jetairways.com, making it 10.66 JPMiles for every Rs. 100 spent. You also get 10,000 JPMiles in the first year towards obtaining the card, and 5,000 JPMiles towards renewing it every year. With a JPMiles Earning Co-branded card, you get to keep your JPMiles alive for five years instead of the usual three years. Beyond that, there is a special offer currently being offered, which brings on an added 2,500 JPMiles as well. Besides, you get a free ticket code per annum, which can be used for a free Jet Airways Economy Flight, to be booked at least 14 days out. These free ticket codes, when used strategically, help me recoup the value of the card in one go. The Card offers 5% discount on Jet Airways Economy Class tickets booked for travel across India or International segments, as long as they are in the following classes: Y, M, T, U, N, L, Q, S, K, H, V, O, W.
Jet Airways American Express Platinum Credit Card holders qualify for dedicated check-in facility on Jet Airways flights, at six airports in India which include Mumbai, Delhi, Chennai, Kolkata, Hyderabad, and Bengaluru. For Excess Baggage, those flying in Premiere get an additional ten kgs, and those flying Economy get an extra five kgs over and above their basic baggage allowance on their ticket. Other Benefits include offers from Oberoi Hotels & Resorts, as well as a free Priority Pass. Additionally, you get Preferred Hotels & Resorts free Elite Tier which is the highest tier in their program. Usually, first-year offer is 10000 JPMiles, however, with this specific link, you get 12500 JPMiles in the first year. Fees for the first year is INR 5,000 + GST. I have had this card for over five years and hardly had any issues with this card. The customer care is excellent, the card benefits, such as visits to the Delhi T3 lounge are very nice as well. Additionally, you frequently receive substantial discounts such as 15%-20% on tickets. « Catch our Paisa Vaisa podcast on points, miles & luxury travel! I see from cards.jetprivilege.com that an additional 10000 bonus JP Miles will be awarded if we spend 15000 in first 90 days. I have spent 15000 and I dont see 10000 bonus jp miles in my account yet. When I spoke to American express they are asking me to contact jet airways support. Can someone reply their experience on getting these additional JP Miles. Also if you’re a Jet Privilege Platinum member, they will waive off the annual membership for lifetime (i.e. if you maintain Platinum level) which means no free tickets and a different free JP miles structure. The process is very easy, with no requirement for any income proof etc. But they are offering 7500 JP Miles upon spending INR 15k in the first 90 days. I’m sure all Jet Platinum members know this. Can anyone help me direct to the MITC for this card on official american express website? I am unable to find it. Also, I cannot find any mention of renewal benefits on american express website. Rs 10k renewal fees seems to be quite steep for non-platinum members! Do we need to register for preferred hotels and resorts ? Or is it by default ?